One of the most common applications of EDM within the aerospace industry today is fast-hole drilling. This process is particularly abundant within blade (rotor) and vane (stator) engine components, where each segment is designed with multiple small and shaped cooling holes to cool both the inner- and outer-part features. These features also create a thermal airflow insulation barrier that helps isolate the segment details from the high-temperature engine gases. The need for EDM drilling with advanced capabilities has grown substantially due to new engine production requirements, as aerospace manufacturers strive to improve engine performance and reduce fuel consumption. Despite its prevalent use, EDM drilling has historically faced several shortcomings in performance and machine capabilities, including processing speed, reliability in small-diameter electrode operation, automated capabilities, electrode monitoring, automatic guide changing, tool-change time, multi-axis part positioning, and breakthrough sensing and control. These limitations are often overlooked, due to a lack of alternative processing options available on the market. The need for EDM drilling with advanced capabilities has grown substantially due to new engine production requirements, as aerospace manufacturers strive to improve engine performance and reduce fuel consumption. To achieve these goals, new engines are being designed with additional cooling holes for improved airflow efficiency and special thermal coatings to increase the operating temperature. As such, the efficiency and quality of EDM drilling operations are critical to airflow and engine component cooling. New materials are also continuously developed to improve engine performance and longevity; and most of the blade and vane segments are made from a derivative of InconelÂ®, a high-temperature nickel-chrome alloy. 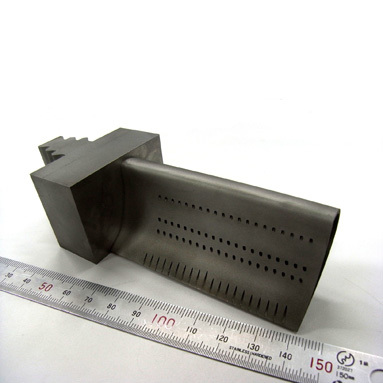 Many cooling holes are simple, round holes that are concentrated on the leading edge of the component; however, more complex cooling hole geometries, called diffuser holes, do exist. Concerns of overall efficiency, back-striking and metallurgical quality create a multifaceted challenge within EDM hole-drilling processes, requiring a maximization of machining speed, while improving control of the machining depth. Diffuser holes feature tapered or funnel shapes that lead into a finished "through hole," which functions to enhance airflow for cooling purposes. Diffuser hole shapes can have variations in geometry and depth on the same part, and they are machined to blend into the complex, 3-D shape of part details. Their geometries can range from tapered round cones to tapered squares or rectangles; the final through hole is often not centered to the outer diffuser shape. Diffuser hole sizes can vary; however, some typical values are 0.060 inches by 0.032 inches by 0.040 inches deep (1.5mm by 0.8mm by 1.0mm), with a final 0.020 inch (0.5mm) through hole. The EDM drilling of diffuser shapes is performed using a tube electrode the size of the final through hole. A contouring-tool-path pattern, similar to that of a milling process, is used to machine the funnel diffuser shape. To accomplish this, the process involves performing a series of changing X- and Y-axis contours, while stepping down in the Z-axis. Blade and vane components, which are commonly casted parts, typically feature a hollow interior for weight saving and internal airflow. During the EDM drilling process, the cooling holes break into these internal cavities. To preserve the correct airflow, it is critical that no back-wall impingement, or back-striking, takes place during the drilling process. Back-striking occurs when the drill comes in contact with the opposite internal cavity wall, which can cause disruptions in airflow and subsequently the cooling efficiency of the engine component. As with other aerospace components that utilize the EDM process, metallurgical quality is also an important concern. The most crucial characteristics are the recast (the re-adhered molten material) and heat-affected zone (altered microstructure area of the underlying base material), as these values will impact the operating life cycle of the component. These concerns of overall efficiency, back-striking and metallurgical quality create a multifaceted challenge within EDM hole-drilling processes, requiring a maximization of machining speed, while improving control of the machining depth. Makino recently introduced a new high-speed EDM drilling machine called the EDBV3 (Electrical Discharge Blade and Vane), specifically designed to overcome the challenges of cooling hole production. The EDBV3 was designed around Makino's proven EDM platforms, incorporating a programmable rise-and-fall drop-tank design that provides open and easy access for operators or automated equipment. Its dielectric water reservoir has been integrated into the base casting of the machine, which saves on valuable floor space and provides greater thermal stability for improved accuracy. Onboard filtration and resin systems of the EDBV3 consist of two large-capacity filters and a separate deionization resin cylinder to control water conductivity. These proven systems ensure consistent water quality, to further enhance the reliability and repeatability of machining results. The EDBV3 also offers several conversational pre-programmed diffuser shape profiles as a standard feature on the controller, but can alternatively apply direct G-code geometry from a CAD/CAM system to support more advanced contour requirements. 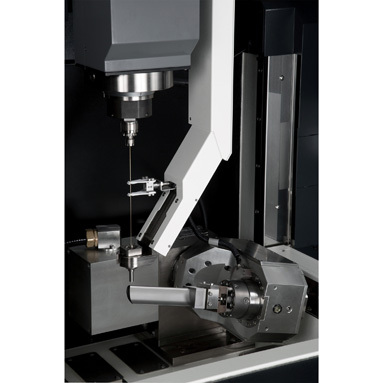 The EDBV3 is equipped with an integrated 2-axis rotary table for positioning of the workpiece. All rotary table movements are managed by the machine's controller and are combined into a single program. Other standard machine specifications include a 1,000 rpm C-axis rotating spindle and a 7.0 Mpa (1,015 psi) high-pressure flushing pump. Machine stroke capability of the EDBV3 is 14.5 inches by 10.6 inches by 19.6 inches (370mm x 270mm x 500mm) for X, Y and Z axes, respectively. All EDM drilling on the EDBV3 is performed fully submerged under water. This enables faster machining speeds, improves part quality, and creates more stable and consistent conditions during cavity wall penetration. The most significant improvement is to machining speed, which in recent test validation has demonstrated up to 10 times faster processing than conventional technologies. An additional benefit to submerged machining is the elimination of water splashing and potential slip hazards common in other EDM drill designs. 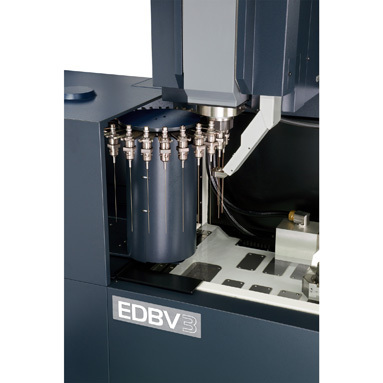 To further improve productivity, the EDBV3 uses a single-electrode processing approach, which avoids the high cost of custom multi-electrode holders and standardizes the tool holders with a more flexible and cost-efficient system. Metallurgical testing performed on the EDBV3 to produce common hole sizes in Inconel material achieved consistent recast and HAZ levels of under 12 Âµm (0.0005 inches), using optimized speed settings. 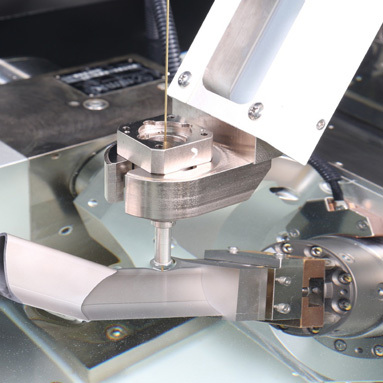 Automatic tool change (ATC) and automatic guide change (AGC) systems are essential requirements for long hours of unattended machine operation and provide a programmable, automated in-process ability for machining varying hole diameters. The EDBV3 combines the electrode holder and die guide together into a common assembly, for quick and easy automated exchanges. Automatic tool change (ATC) and automatic guide change (AGC) systems are essential requirements for long hours of unattended machine operation in varying hole diameters. The special tooling developed for the EDBV3 integrates the electrode and die guide into a preassembled locking unit. During a tool change, the joined assembly is exchanged with one motion, eliminating the traditional "feeding" motion of inserting the electrode tube through the die guide. This saves valuable production time, with ATC and AGC exchanges that are executed within 30 seconds. The standard configuration of the EDBV3 includes a 24-station tool carousel system and 24 holder assemblies to fully tool up the machine. For extended operations that require automation, provisions have been designed, so that the entire 24-station carousel can be exchanged as a palletized magazine. The EDBV3 uses a rigid guide-arm assembly to hold, locate and support the die guide, which can be alternately used as a programmable axis (W-axis). The arm assembly includes an integrated "middle-guide" system that can be applied when using small-diameter electrodes, preventing whipping, bending and vibration of the electrode. This dramatically improves machining stability; and the middle guide "fingers" will automatically retract as the electrode tube reduces in size, using as much of the electrode length as possible. 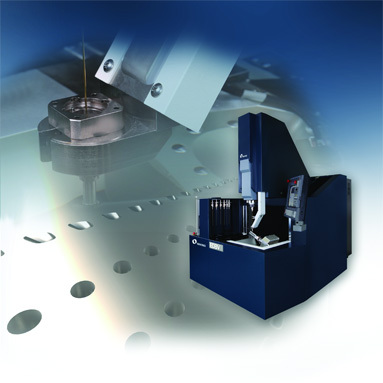 The software of the EDBV3 borrows proven technology from Makino's fine-hole sinker EDM machines. The Model Plan system is integrated into the controller, which provides both user-friendly conversational input screens, as well as direct G- and M-code programming formats. An electrode length management system provides automatic tracking of the electrode length to maximize utilization. This intelligent system will automatically exchange the electrode when the length becomes too short, seeking out the next available electrode of the same diameter within the tool carousel. The EDBV3 features a proprietary, highly sensitive breakthrough detection circuit that can sense cavity wall breakthrough in just one second, which translates to machining depths of approximately 0.040 inches to 0.060 inches (1.0mm to 1.5mm). This breakthrough sensing capability—accomplished while delivering maximum speed and productivity—uses a combination of different adaptive process-monitoring techniques. An important contributing factor to achieving reliable and consistent breakthrough detection is fully submerged processes, which allow debris flushing during breakthrough, for a faster and more stable process. Conventional unsubmerged systems create a very unstable machining condition, as they break through the work piece into open air. While engineering considerations for the EDBV3 were made primarily in regard to the aerospace industry, the versatility and capability of the machine lends itself well to other industries requiring EDM drilling operations. An important contributing factor to achieving reliable and consistent breakthrough detection is fully submerged processes, which enable debris flushing during breakthrough, for a faster and more stable process. Beyond the discussed aerospace applications, there are several other industries looking for more efficient small-hole manufacturing capabilities; they value the process capability and improvements that the EDBV3 provides. The power generation industry, which also uses gas turbine engines, has similar requirements to the aerospace field, but in larger components. The automotive industry also uses EDM drilling for producing the small holes in fuel-injector nozzles. Additionally, the medical industry has a growing need for small-hole machining from surgical tooling and implant components, to medicine fluid delivery systems. The growing demand for EDM drilling capabilities across this diverse list of industries—and certainly in aerospace—demonstrates the extended value of the EDBV3's hole-drilling performance and quality, providing manufacturers with a niche opening to enter additional markets. The EDBV3 combines the electrode holder and die guide together into a common assembly, for quick and easy automated exchanges. The EDBV3 uses a rigid guide-arm assembly to hold, locate and support the die guide, which can be alternately used as a programmable axis (W-axis). EDM drilling on the EDBV3 is performed fully submerged under water for up to 10 times faster processing than conventional technologies. The EDBV3 features a proprietary, highly sensitive breakthrough detection circuit that can sense cavity wall breakthrough in just one second.